One of the more beloved books of modern times, A Course in Miracles is a self-study course in spiritual psychotherapy and a profound text focusing on the principles of universal love and forgiveness. It has had a revelatory impact on people of many faiths and religious backgrounds. Printed on thin bible paper, it consists of the 660-page Text, the 480-page Workbook for Students, and the 90-page Manual for Teachers, bound together in one volume. ColumbiaUniversity and a member of no particular religious group, responded to an authoritative inner voice who identified himself as Jesus. He urged her to take down what would become A Course in Miracles from inner dictation. 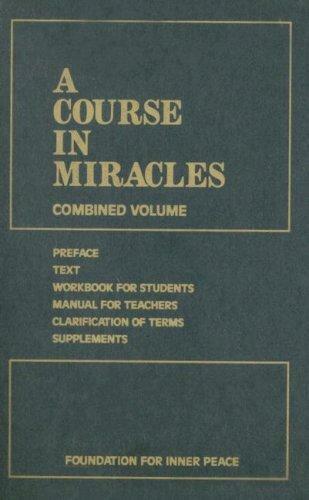 First published in 1975, A Course in Miracles has wrought many an awakening, and many more “finders” will be touched by this powerful text in generations to come. It is a spiritual teaching, not a foundation for a new religion, nor a primer for a “cult of personality.” The Course presents a clear, specific, and theologically profound belief system, based on sound theoretical underpinnings, that also offers practical guidance in daily living. Its teachings are centered on Jesus, but its non-denominational spiritual path is focused on forgiveness in all relationships as the means for returning to God. A Course in Miracles offers spiritual direction for anyone seeking inner peace in today’s complicated world. The Text is largely theoretical, and sets forth the concepts on which the Course’s thought system is based. Its ideas contain the foundation for the Workbook’s lessons. The Workbook includes 365 lessons, one for each day of the year. The instructions, while suggesting lingering day after day with a particularly probing lesson, urge only that not more than one lesson a day should be attempted. Remember only this; you need not believe the ideas, you need not accept them, and you need not even welcome them. Some of them you may actively resist. None of this will matter, or decrease their efficacy. But do not allow yourself to make exceptions in applying the ideas the workbook contains, and whatever you reactions to the ideas may be, use them. Nothing more than that is required. The Manual for Teachers, written in question and answer form, provides answers to some of the more likely questions a student might ask. It also includes a clarification of a number of the terms the Course uses, explaining them within the theoretical framework of the Text. "The only edition that contains in one place all of the writings that Dr. Helen Schucman, its Scribe, authorized to be printed"--P.  of cover.This "combined" edition from the Foundation for Inner Peace is the only complete version that includes all of the writings that Dr. Helen Schucman, the Scribe of A Course in Miracles, authorized to be printed. It consists of a Text, Workbook for Students, Manual for Teachers, and Clarification of Terms. Also included are the supplements "Psychotherapy: Purpose, Process and Practice" and "The Song of Prayer," extensions of the Course principles which were dictated to Dr. Schucman shortly after she completed the Course itself.